I was asked by my sister who lives in Fiji to help out with her son’s class project on advertising and the power of persuasion. I would have loved to come in and talk to the kids – but Fiji is on the other side of the world from the UK. So to help I put a quick 5 minute video together explaining in simple terms an example of an advertising campaign we created for Roland DG and the testimonial approach we used. So, from doing this video, I was ‘persuaded‘ 🙂 to write this article and discuss the power of persuasion in not only advertising but in branding and online. To persuade… or not to persuade. The word ‘persuade’ comes from the latin root word, persuadere, from per- ‘through, to completion’ + suadere ‘advise’. In promoting our services or products, we are advising or helping a customer through to fulfilling their needs. Understanding how to persuade someone to buy your product or service the right way can be a useful advantage over your competitors. One of the most popular concepts in advertising is the testimonial approach. It’s the direct ‘word of mouth’ route. It’s why people read the ratings and reviews before they buy from Amazon or Argos. Most testimonials you read are ‘run-of-the-mill’ feedback for ‘run-of-the-mill’ companies. But, if your product or service that you provide is outstanding – then these customers’ and their reviews, are worth their weight in gold! You have a happy customer who raves about your product – a testimonial or review – which you use to make into the main theme for the advertisement, using their picture or a video. 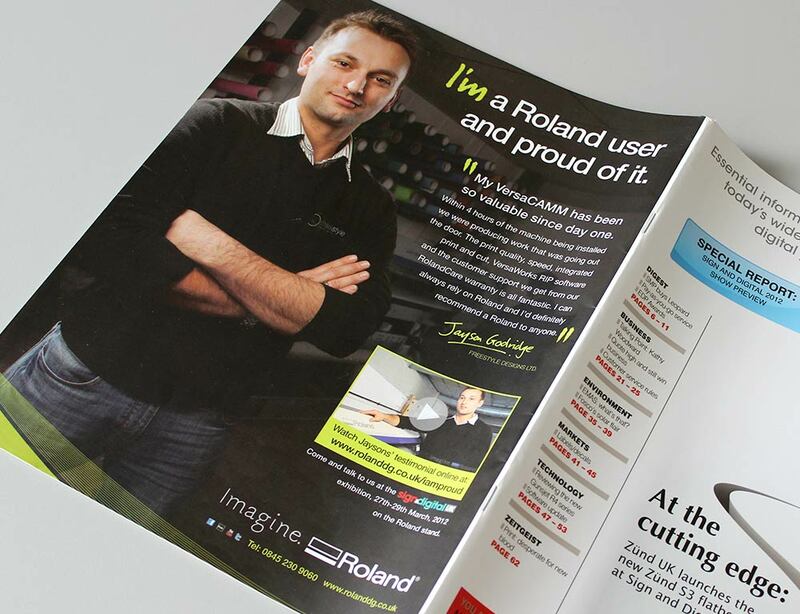 One great example of the testimonial approach was for our clients, Roland DG for their “I am a Roland user, and I am proud” advertising campaign. Below is are examples of one of the first press advertisements and video testimonials we created that they are still using as part of their marketing three years on! At first they felt they didn’t feel the need for photos of their real customers – or even video testimonials done right. But from seeing how many positive and detailed these testimonials were about how good their printers and products were, we were compelled to show that they had to. All Roland customers who were contacted said they were more than happy to endorse the company so we took their photos and video and designed advertisements around the campaign. and the Vanish Tip Exchange stain removal campaign. They also involved social media to build on this campaign. Persuasion in branding and online? This got me thinking on how important the power of persuasion is in branding and website design. How do we persuade new customers without the ‘hard sell’ approach? You need to build trust and authority in your profession. Would you just hand over your hard-earned cash to someone you just met who said they do websites? In the real world, we are social creatures and building trust and persuading a customer is really just about showing up and doing what you say to do – and more (over delivering). Through word of mouth, referrals, locally networking, breakfasts, lunches and drinks – presenting talks, promoting charity events and so on. This helps build that trust – and persuades a customer more gradually so when the time comes that they need your services, it’s a simple decision. On a more national or global level, it’s taking these skills over to your online presence – creating that approachable, professional and honest organisation that shows up and does what it says – plus that little extra! So what do you need to do? Having at least two or three detailed testimonials from your best customers is essential. Also, you need to have a compelling brand story to connect with your users – along with a clear and consistent design that reinforces and builds resonance. This can include case studies of your work, articles, video, how-to’s as well as regular communications that are relevant to your customers and their needs. It’s the difference between them choosing your competitor over you. So how do you persuade your potential customers or clients to choose you? This entry was posted in Branding and tagged Advertising design, persuasion, relationship marketing, testimonial.